Book in One Word: Deceiving! 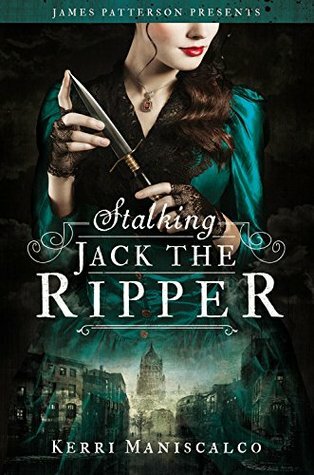 The thing about Stalking Jack the Ripper is that the title (and the synopsis, really) is an implication: I expect the novel to be about stalking Jack the Ripper, for the most part. And while that definitely happened, it didn't happen enough. In short: I expected more. I'm not saying this as a complaint, per se, but it's something I wanted more of but that was lacking--it was an expectation. If I had to say what this book was about, I don't know that the central focus would be Jack the Ripper and solving murders--there was more than that. Now, that's not a bad thing, but...I wanted more murder. I just wanted...more. I'm not really sure how to explain it? Because I liked Stalking Jack the Ripper, I did. But there was some sort of disconnect, something that prevented me from really, really liking the novel. Yet I don't mean this in a negative way? I enjoyed reading this book, but there's something about it that just missed the mark. Like I just said a million times: I did like this book. It just wasn't what I had expected and was looking forward to. That said, Stalking Jack the Ripper had a lot of good things going for it. One thing I appreciated was the writing, which really fit the era but didn't feel so overbearingly historical as to take away from the story that was being told. As a whole, the writing was good, too. And despite the fact that this book featured gruesome murders and detailed descriptions of cadavers and butchered bodies (which was a plus), the tone was relatively light, which helped make the whole thing more readable, in my opinion. Stalking Jack the Ripper features a number of characters, a mysterious, gory killer who goes by Jack the Ripper included. But the real main character is Audrey Rose Wadsworth, a seventeen-year-old of a fine upbringing who sneaks off to dissect human bodies with her father's estranged brother. That's because Audrey Rose has a liking for studying anatomy, seeing inside bodies, and discovering what caused their demise. But in her time and age, it is extremely frowned upon for women to do such a thing--to see such a thing--so she sneaks around with the help of her brother Nathaniel (who I liked right off the bat) and her uncle's assistant and student Thomas Cresswell. Nathaniel, unfortunately, didn't get much page time, but Thomas--well, he needed more page time. I liked him and I'm all for romance, but I needed him and Audrey to spend way more time together and for there to be more sexual tension and build up. It was just there and lacked the build up to create a romance that could've been strong. Buuut the two do work together to solve a few conundrums--including who Jack is--which is oh so romantic--and create a sort of mutual understanding and friendship filled with snark and quips, which I love. Would I reread it? Maybe? Would I purchase it? Eh, I don't really need it. Who would I recommend it to? People who like historical fiction that's light on history and isn't heavy on era-fitting prose, a compelling cast of characters, and bits and pieces of murder. After all I’ll be subscribing to your Jack the Ripper feed and I hope you write again soon! BTW this is great post.